How much does a Thermostat Replacement cost for your car? The cost of a Thermostat Replacement depends on the type of car you drive. On average, you save 20% with Fiix. The thermostat helps regulate the temperature of your coolant in the engine, along with components such as the coolant tubes in your engine’s cooling system. It is actually a valve inside your engine that will open and close based on the temperature it senses your engine is at. It will open wider when your engine gets hot, and close more once it cools down. A working thermostat is a must to make sure your car is always at a temperature that is just right. Vehicle engines need to always be at an optimum temperature, and a working thermostat is one of the controlling parts that ensures this is the case. With improper coolant flow, your vehicle will be unable to get rid of excess heat and be prone to episodes of overheating. 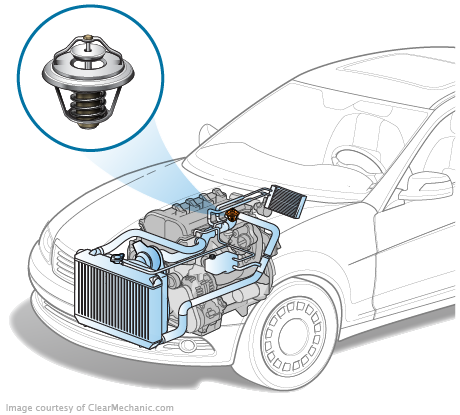 If you face any of the above issues, have one of our certified mechanics come by and fix your thermostat.